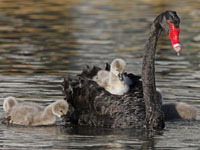 Remaining cygnet and parent swans healthy. 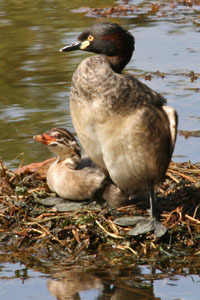 RSPCA is calling for information on death of other cygnet - please phone 9209 9300.
to far side of lake. 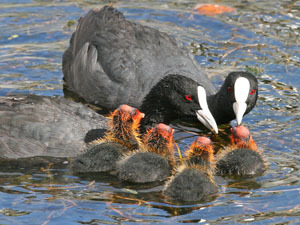 Last batch of coot babies are now all all independent. 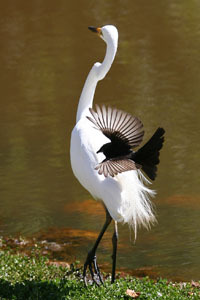 New for the lake in daylight hours has been a Nankeen Night Heron. 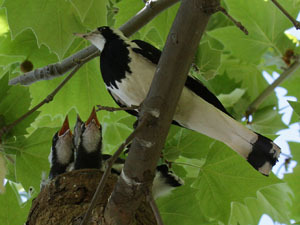 Mistletoebirds have also been around - they are feeding in nearby ficus trees. 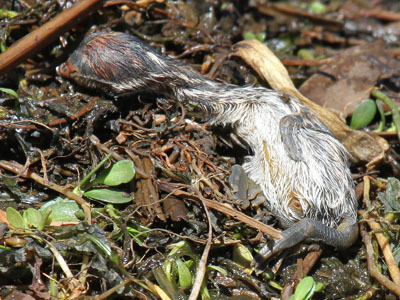 1 cygnet killed by cowards at 3:30 am on Australia Day long weekend!! New (different) pair of swans arrived 10 days ago. 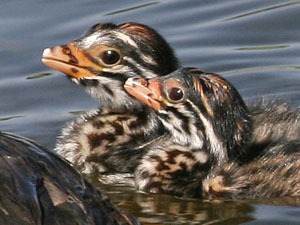 - unfortunately the eldest baby has already started pecking the other babies!! 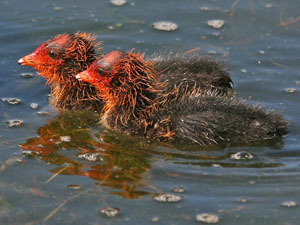 A number of coot babies also hatched recently but only 1 young one remains. 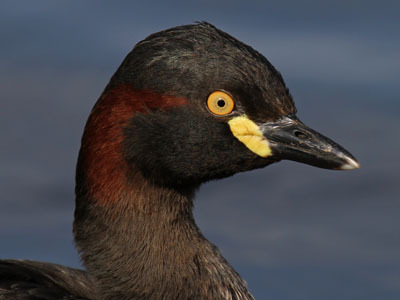 - last seen on South perth foreshore but only 4 cgnets remaining. 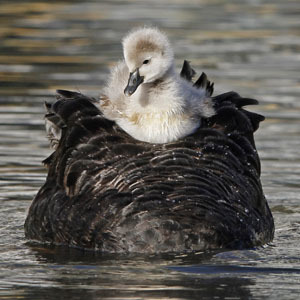 Youngest cygnet hitches a ride! 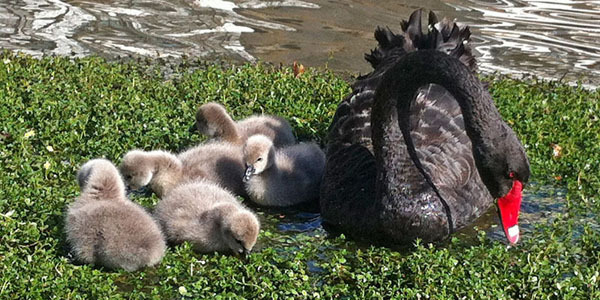 Watches from Mum's back while the other cygnets swim! 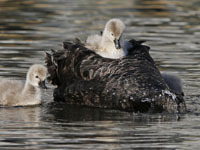 Although not common on Sunday both Mum and Dad each briefly had a cygnet on their back. 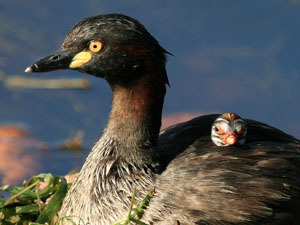 The grebe is still sitting in reeds near the swans nest. All 5 cygnets went for a swim around the lake while the sun was shining around lunch time. 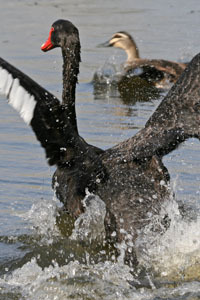 Both parents were very protective and scared off any ducks that came too close to the cygnets. 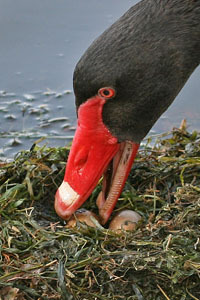 - at 4pm it was still wet after emerging from the egg and smaller than the other fluffy cygnets. 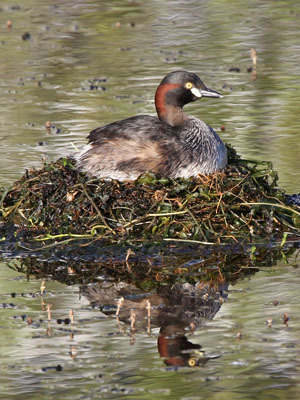 The grebes have started a floating nest hidden in reeds just 3 metres from the swans nest! 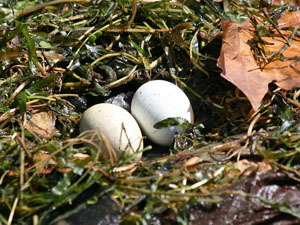 The swans now have laid 5 eggs. 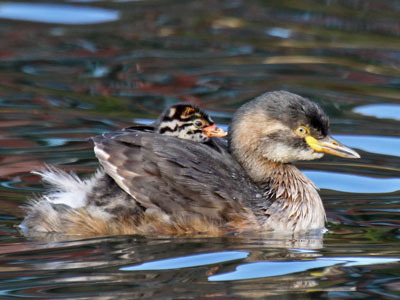 This is the first time they have nested in this lake. 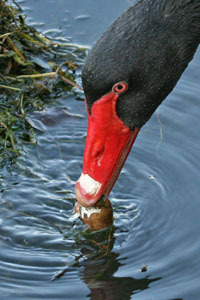 Two swans have been building a nest in the reeds. 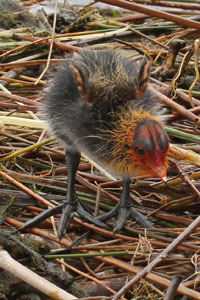 The first egg was laid 3 Jun. 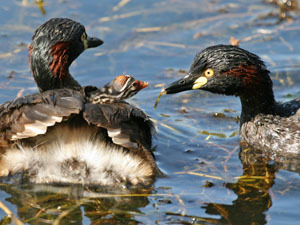 The grebes have been sitting for about 2 weeks without any major incidents. 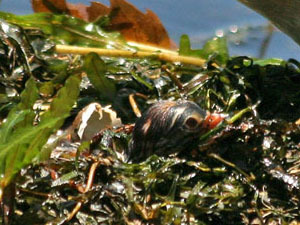 Although the nest has shifted a little it is now contained by an outer ring of pond weed. 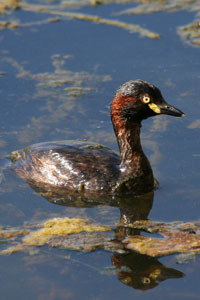 New grebe nest has been well made and the lake has lots of algal growth. 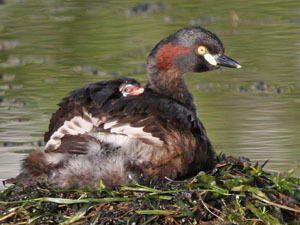 Both grebe babies lost - not sure how but lack of floating nest a factor. 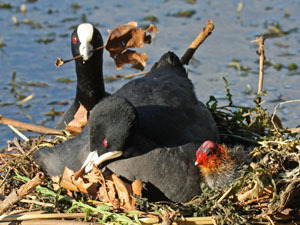 Coots have started building a new nest close to the path. under the bridge but I retrieved it after work as it still had an egg in it. 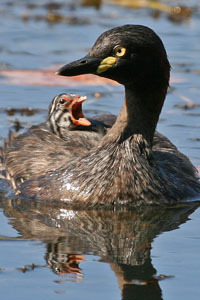 parent having to fend off a cormorant claiming fishing rights in the same area as the nest. 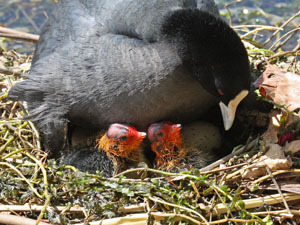 All 3 coot babies currently feeding safely around the lake. 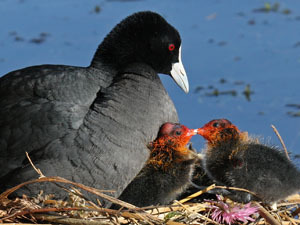 The coots high nest mound of dead reeds hatched 3 babies on 13 Dec.
including returning to the nest every day for first 2 weeks. 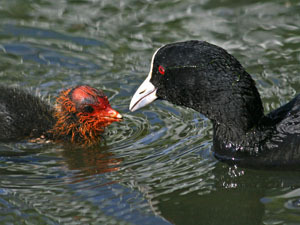 The coots raised 2 babies while the grebe babies were all lost within 3 days. 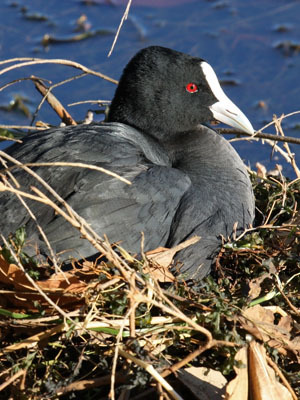 The coots have been sitting on their nest for a while. 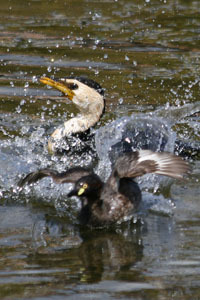 Action: the coots and grebes are each building a nest - only 3 metres apart. 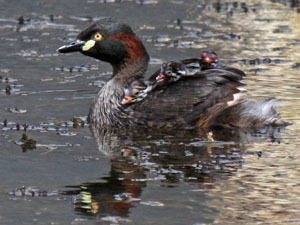 and may have also affected the nesting location. 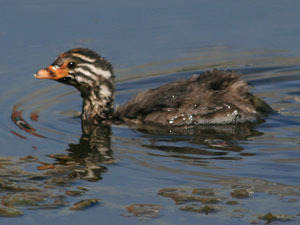 A dozen white eyed ducks (hardheads) have been feeding on the lake for a week or two. 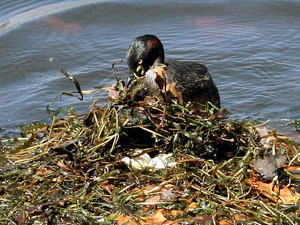 Grebes were adding plant material but nest did not survive. 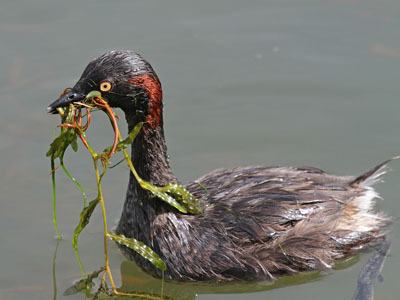 grebes paired up and began collecting weed for a new nest near the centre of the lake. 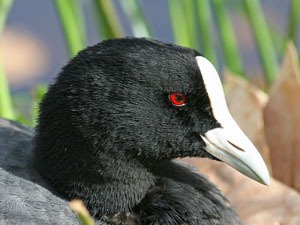 The coots no longer near the nest - no young. 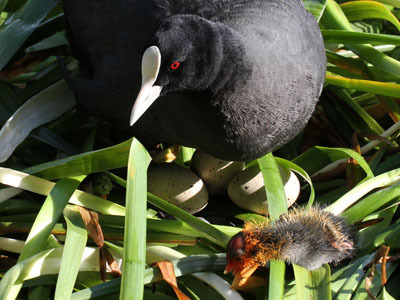 The coots have been sitting on eggs at a new nest - due to hatch soon. 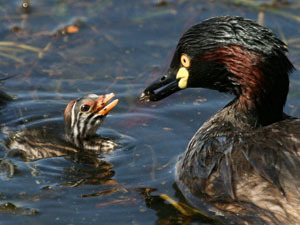 - only 2 juvenile grebes remain on lake - only 1 parent willing to feed them. 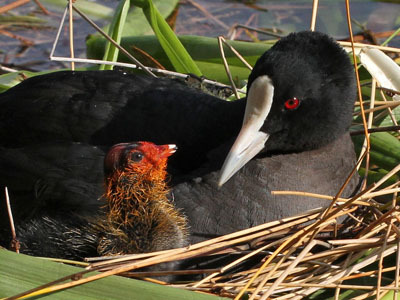 The coots have lost all the babies - possibly by a cormorant. 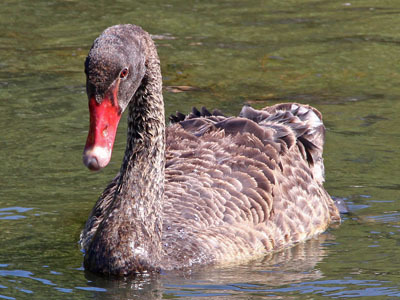 - there have not been any swans present for more than a year. 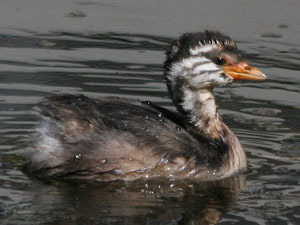 Young grebes growing fast. 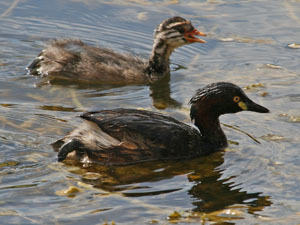 The grebe babies have shown signs of independence much sooner due to plentiful food. have grown very fast with minimal rivalry beween siblings. 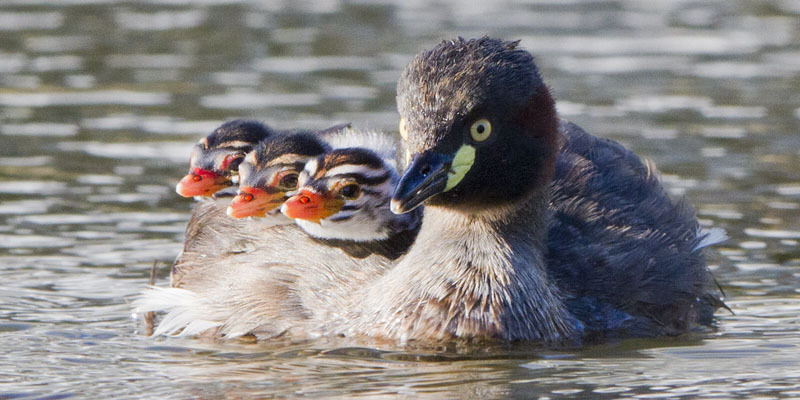 There are now a total of 4 baby grebes - they probably hatched on 25, 26, 27 and 28 of Jan.
but they are old enough to leave the floating nest and swim around the lake. 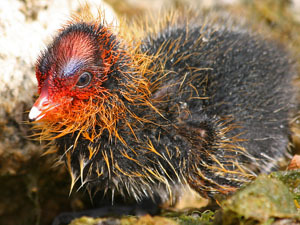 If you are looking to see them for the first time understand that they are very tiny! 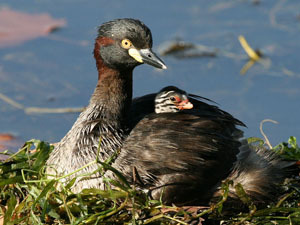 - the young babies are currently resting on the nest with occassion trips on their parents back. 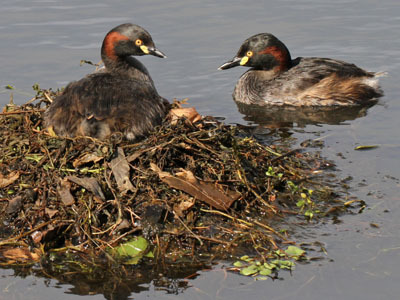 The adult grebes have built a new floating nest and are now sitting on eggs. 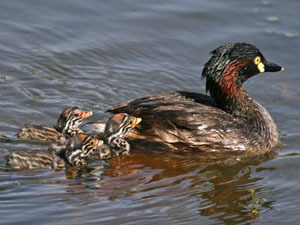 The 4 young grebes are almost fully grown and still on the lake but keeping out of the way of the adults. 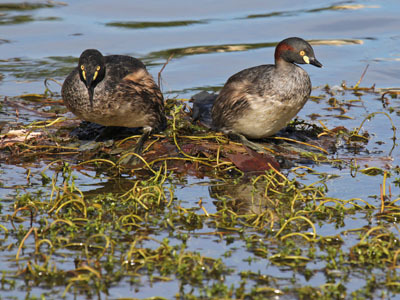 Early this morning they were resting on the final remains of the last nest which is still floating (just). 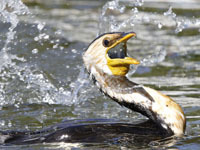 The juveniles can all feed independently. 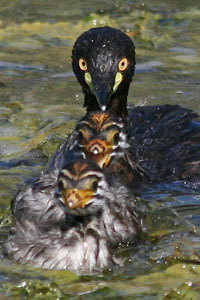 it is still able to compete for food when the other babies are mostly full). 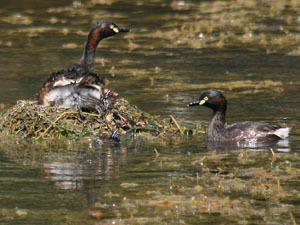 The floating nest is in good condition near centre of lake and still being used overnight. 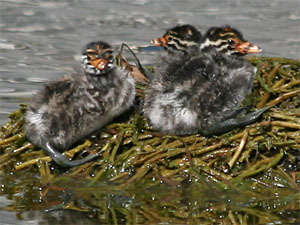 Grebes have hatched! 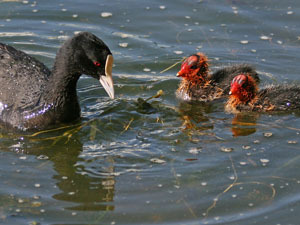 2 young coots mid sized and feeding with parents. 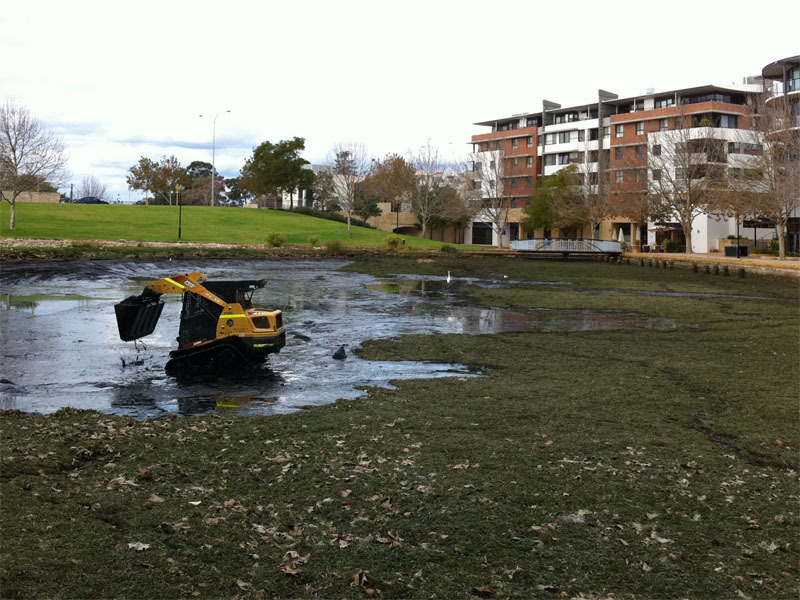 resurfacing of the lake bottom and subsequent refilling. 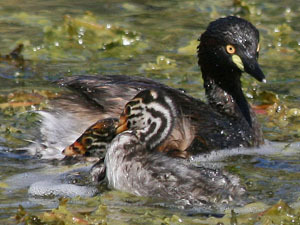 - grebes refusing to fly despite only tiny puddle of gunky water left. 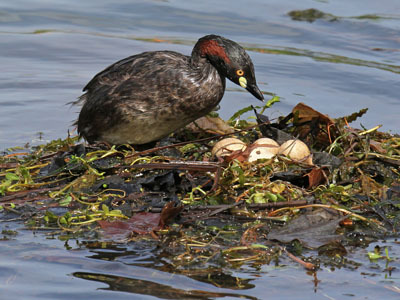 Parent grebes have a new floating nest with eggs. 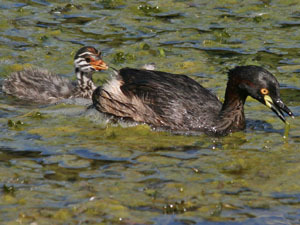 3 young adult grebes still remaining on other side of lake. carry a butterfly net for rescuing wildlife!! 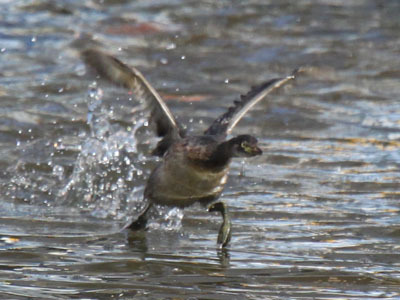 They soon had the babies back in the lake. 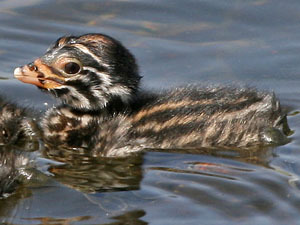 Success: 4 baby grebes, 4 baby coots! at St John of God Hospital, Murdoch. Had an operation 1 March to remove tumour and remains of pituitary. 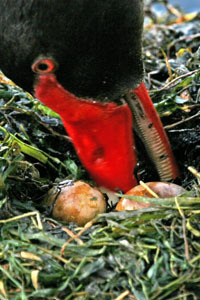 while still taking turns at feeding the baby - next hatching due just before Christmas! 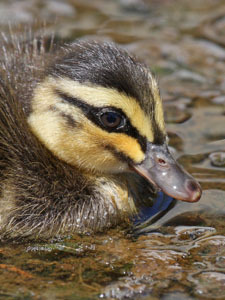 - the single surviving young has done very well and feeds independently - success despite all the nest problems! 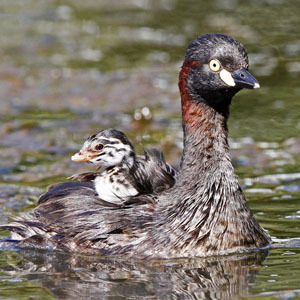 the new babies and also allows them to ride on its back. 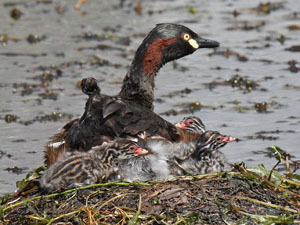 Grebes: new nest gone! completely gone! 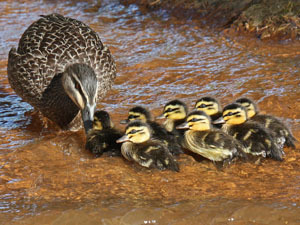 often in a close group without rivalry - but not allowed by parents any where near the new nest! 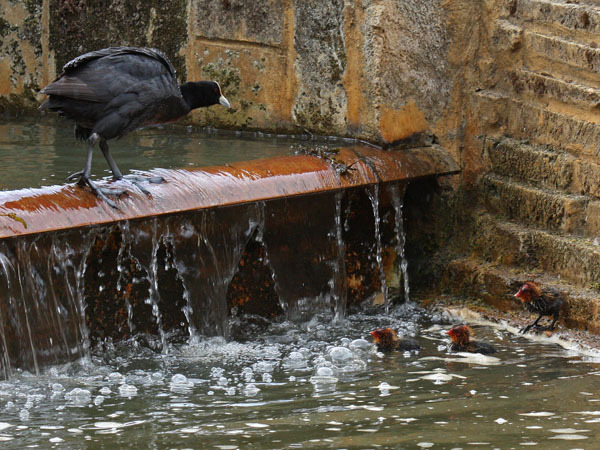 3 baby coots have hatched in the last week - today the babies went over the falls below the lake! 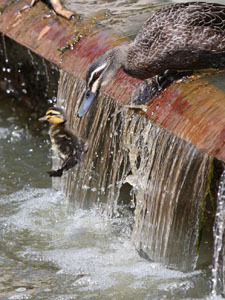 Despite trying to return to the safety of their nest they were unable to get up the falls or climb the steep walls. 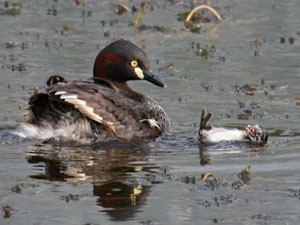 Fortunately a kind local gent caught them using a plastic colander and they are now back in the main lake. 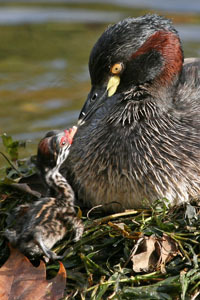 3 babies out so far and 2 eggs remaining - 1 with a little hole ready to hatch! + goofy learning back stroke! 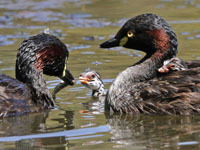 17,18 Dec - saw 1 adult go ashore for a rest - leaving bossy baby to feed itself! 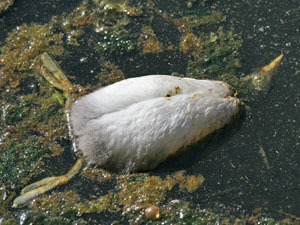 9 Apr - only one baby surviving - body of second baby floating in lake - starvation not predation! 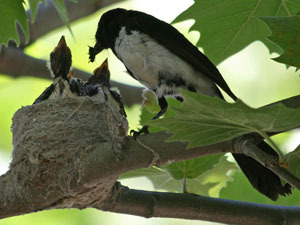 over the last 2 months) but forced starvation by parents and biggest sibling! 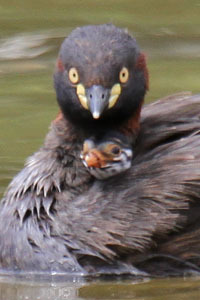 the other parent was feeding the large baby. The nest has disappeared completely. 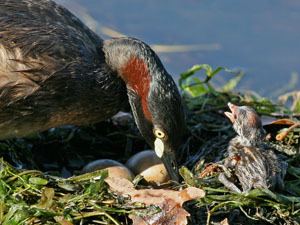 keeping it away from most of the food - even the parent was biting the smallest baby. 23 Mar 07: still 4 babies but one is much bigger and growing fast !!! 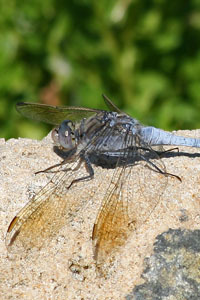 swimming near the nest or sitting on top of it - I have seen the parents catch dragonflies, shrimp like creatures and small fish. 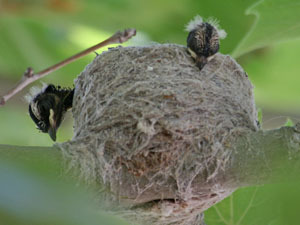 nest overnight with the babies, they are also using it as a resting place at various times during the day. 12 Mar 07: 4 babies have hatched so far. 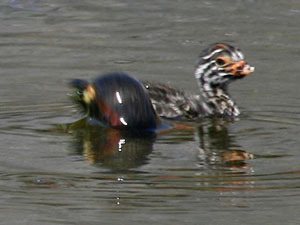 11 Mar 07: Sighting of a new baby grebe by Alison. 8 Mar 07: Last 2 days were both over 42 degrees Celsius in the shade and bloody hot in the sun. 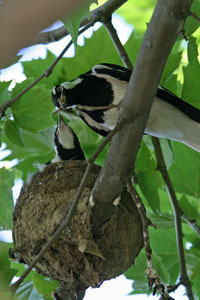 1 Mar 07: New nest is large, floating and well anchored, parent birds are taking turns incubating new eggs. 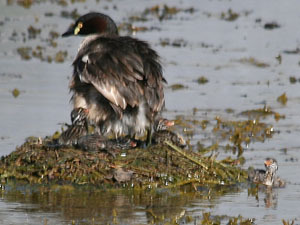 10 Feb 07: The parents have now started building a new nest in the centre of the lake. 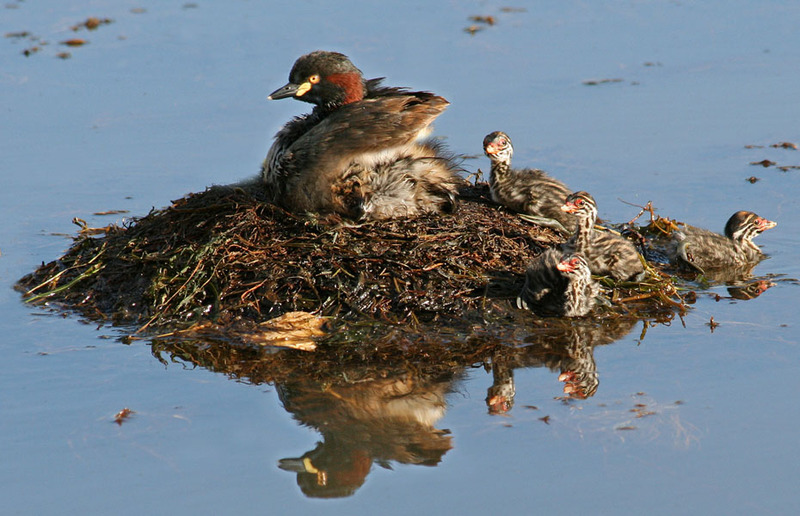 Parents along side their floating nest - the incubating eggs have been covered over. 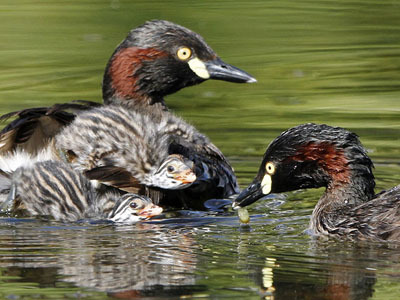 The birds decided to breed close to a major walkway near shops and apartments on a landscaped lake in East Perth. 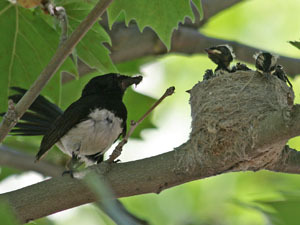 The nest mostly stayed in the one place but some days moved more than 20 metres - probably due to the wind. 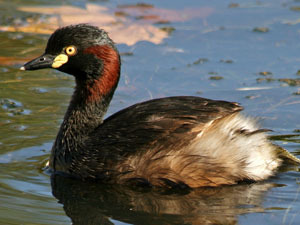 The Australasian Grebe's scientific name Tachybaptus novaehollandiae means 'fast sinking' and 'new holland'. 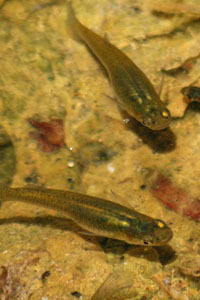 but they can also submerge very slowly (a bit like a submarine). 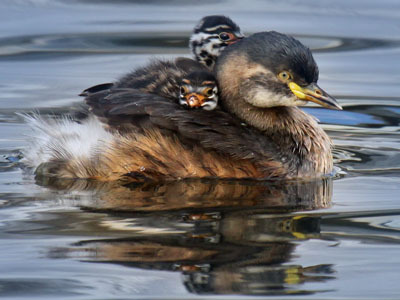 Many local residents, workers and visitors have watched the grebes with interest since December 2006.
hired a 100-400 L IS USM (f/4.5-5.6) lens from Plaza Digital in Perth as the grebe babies were so tiny. To save bandwidth higher resolution photos have not been included on this web site. Bev Blackwell and Alison De Mattia provided information and feedback. Statistics on usage of this site are gathered by Google Analytics and Chilli Tech web stats. Please feel free to email me any corrections or for further information.